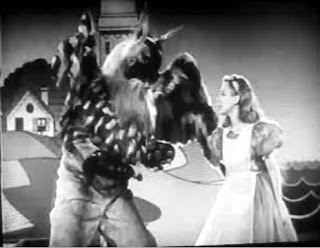 Here's a very thoughtful article in the Guardian Co UK movie blog on how different versions of Alice in Wonderland have portrayed Alice, and how true they were to the book. The author is, of course, concerned about Tim Burton's choice of 19 year old Mia Wasikowska for Alice in Wonderland 2010. This got me to thinking about how many versions there must be. If you're wondering now, see the IMDB search results here. The author is also astute enough to mention one of my favorite versions, Jan Svankmajer's rather dark stop-motion version of Alice. Recently I noticed that there was an Alice in Wonderland outfit for sale for people who play Second Life. Here at this NSFW site are some more Second Life designs. They're definitely on the dark side of Alice, and include vampire bites and blood red tears. 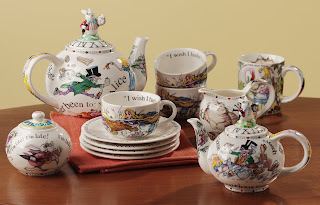 Last we have some very nice Alice in Wonderland tea sets. It looks like they have adult tea sets and children's tea sets.